Jeff Bagwell – I think the Red Sox might think about how helpful Larry Anderson was for them when they traded Jeff Bagwell away for him. With the Astros, Bagwell was a constant power threat in the middle of the lineup. The biggest problem for Bagwell to overcome is his lack of a big stat. 2,314 hits, 488 doubles, 449 home runs, 1529 RBI and .297 batting average, none of these on their own will get him in, but the consistency that brought together all those numbers should get him close in 2015. Craig Biggio – Along with Bagwell, Biggio combined to be a deadly combination in the Astros lineup. 3060 hits, 668 doubles, 291 homers, and a .281 average are pretty great stats. The best thing about Biggio is that he would play anywhere on the field. After coming up and playing four seasons at catcher, and fifteen years as a second basemen, he went to play another five in the outfield, mainly in center. He is one of the greatest examples of what a baseball player should be. Barry Bonds – From 1992 to 2007, Bonds didn’t lead the league in walks four times. Two of those seasons were cut short by injury. Career leader in homers, walks, and intentional walks, a .298 BA / .444 OBP / .607 SLG is pretty unbelievable. The unbelievable amount of walks left him short in many other categories, such as leaving him 65 hits shy of 3,000. Oh yeah, he also won 7 Most Valuable Player Awards. Put him in the Hall and tell the story. Roger Clemens – 7 Cy Young Awards and an MVP Award, 354 Wins and a 3.12 ERA should make him a sure fire lock for the Hall of Fame. He won his Cy Youngs with four different teams and in both leagues. As I said with Bonds, put Clemens in the Hall and then tell the story. Randy Johnson – The Big Unit is easily one of the greatest left-handed pitchers of all time. Having won five Cy Young Awards (including four in a row) and finishing in the top 3 another four times, winning over 300 games and being the career leader in Strikeouts Per 9, with 10.6 makes him a sure fire lock for the Hall. If he doesn’t get in on his first ballot something is wrong with these voters. Pedro Martínez -Two spots behind Randy Johnson on the career K’s Per 9 list is Pedro with 10.04. He also won himself three Cy Young Awards along with another four top 5 finishes. He finished his career with a 2.93 earned run average and maybe be one of the last players to end his career under 3.00. Currently the only active pitcher with a career ERA under 3.00 is Clayton Kershaw with an 2.48. 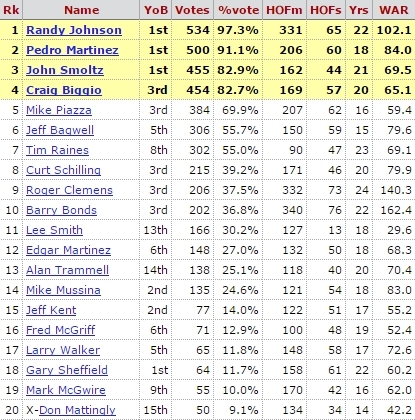 The main thing I see keeping Pedro out of the Hall on the first ballot is his lack of wins, totaling only 219. However his Ks and ERA should be enough to get him in. Mark McGwire – Growing up Big Mac was on of my favorite players. I was a huge baseball fan in the early 90’s and the strike of 94 really turned me off of the game. When baseball came back there were two huge things that sucked me back in, Cal Ripken Jr. surpassing Lou Gerhig’s consecutive game streak, and of course, the home run spectacular put on by McGwire and Sosa in ’98. Only having 1626 hits, a .263 average, and his PED situation is probably going to keep him out of the Hall of Fame, but I think he should be in there. Mike Piazza – Drafted 1,380th overall in the 1988 draft as a favor, Piazza wouldn’t squander that opportunity. Piazza is arguably the greatest offensive catcher of all time. 10 Silver Slugger awards, 427 homers (396 as a catcher), and a .308 average should inch him closer to getting in. Last year he brought in over 62% of votes (75% needed for entry), and this year he should get a little closer. if he doesn’t get in this year, he should definitely make it next year. Lee Smith – Since Closers are finally getting the respect they deserve, it’s time to get Lee Smith in the Hall. His 478 career saves put him in 3rd place all time behind only Mariano Rivera (652) and Trevor Hoffman (601). I don’t really see Lee Smith getting into the Hall, but I think he’s done enough to deserve my vote. John Smoltz – With Glavine and Maddux already in the Hall, it’s time to get the 3rd pillar of the Braves rotation from the 90s in. Not only was Smoltz a great starting pitcher, having won the 1996 Cy Young, he would also show that he is a great reliever, saving 144 games in three seasons as the Braves’ Closer. With Dennis Eckersley, they are the only two pitchers to win 20 games in a season and save 50 in another. I’d love to see Smoltz in the HoF, but I think it’s going to be an uphill battle for him. 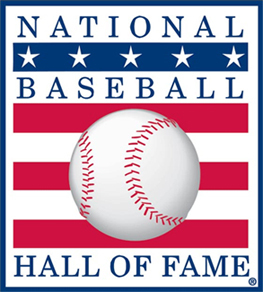 Congratulations to the Hall of Fame Class of 2015, Randy Johnson, John Smoltz, Pedro Martinez and Craig Biggio.